#1 Expand our understanding on Temple insights, a. Purpose of the temple, b. Operations within the temple, c. Design and structure of the Temple, d. Timeline for the location and completion of the Temple. Ground-breaking for the temple is listed among the church’s three-year goals (to be accomplished by April 2016), and “the Temple completed and functioning in all aspects” is on the list of five-year goals (April 2018 deadline). Given that the design is not slated to be finalized until April 2014, the early artists’ rendering attached to this post may not reflect the final plan. The Remnant Church is one of the denominations that coalesced out of the “Restorationist” movement — a late 20th-century conservative split from Community of Christ. The proposed temple will be at the heart of the Remnant Church’s new zionic community, known as “Bountiful” (named for a city and land in the Book of Mormon). Building zionic communities has been a core theme within the Latter Day Saint tradition dating back to the foundation of the movement. Only a handful of Latter Day Saint tradition churches have completed full-scale temples. Community of Christ has two: the first was completed in Kirtland, Ohio, in 1837, and the second in Independence, Missouri, in 1994. The Church of Jesus Christ of Latter-day Saints (LDS Church) has built dozens, the first of which was completed in St. George, Utah, in 1877, and the most recent was dedicated in Calgary, Alberta, in 2012. 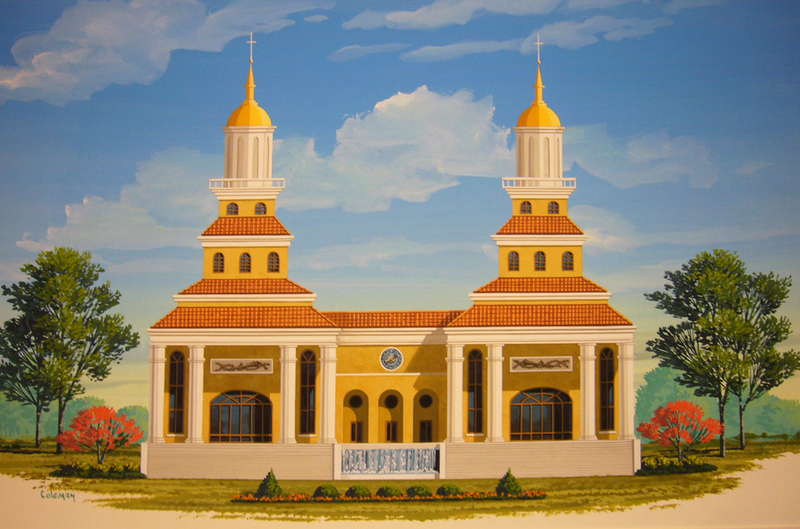 The Apostolic United Brethren (the largest fundamentalist Mormon denomination) reportedly completed a temple in Ozumba, Mexico, in the 1980s (I would very much like to have photographs of this structure), and the controversial Fundamentalist Church of Jesus Christ of Latter Day Saints completed a temple near Eldorado, Texas, in 2007. Although sharing a common origin, the different denominations view temple worship very differently. Community of Christ and the Remnant Church look to the experience of the early church at the original temple in Kirtland for inspiration. The “endowment” associated with Kirtland was described as an empowering, outpouring of the spirit. The LDS Church, the AUB, and the FLDS Church, by contrast, look to later developments at Nauvoo, where the concept of endowment was changed into a liturgical ritual that Joseph Smith adapted from Freemasonry. Nauvoo also saw the introduction of proxy rituals for the dead, including baptism for the dead, as well as “celestial” marriage (polygamy). The AUB and FLDS Church continue to practice plural marriage, but the LDS Church has redefined celestial marriage as a union of one man and one woman. The Remnant Church, of course, opposes polygamy and makes the faith claim that Joseph Smith was not associated with its origin. Notes (original post UPDATED to add new footnote 3]. The Hasting Times, Vol. 13 No. 4 (2012), p. 14. PDF archives here. Several, including the Church of Christ (Temple Lot) and the Church of Jesus Christ of Latter Day Saints (Strangite) have attempted full-scale temples that were never completed. Others, including the Wightites and Cutlerites, set aside portions of smaller buildings to perform Nauvoo-era temple practices. Some structures that the LDS Church considers temples, such as the temple in Hong Kong and the temple in Manhattan, similarly set aside only portions of the structure as a temple. Kirtland Temple was the only Latter Day Saint temple completed by the early church prior to the 1844 succession crisis, from which all extent denominations of the movement ultimately emerged. Community of Christ gained clear title to Kirtland Temple in 1880. LDS men may still be sealed to multiple wives polygamously in the afterlife, but only one wife at a time in this life. This entry was posted in Mormonism, Temples. Not to be a pedantic, but I take issue with the implication that the CoC “completed” the Kirkland temple and that the “first” temple completed by the LDS Church was the St. George temple. As the Kirkland temple was constructed prior to Joseph Smith Jr’s death the the subsequent schism crediting one branch of Mormonism with completing it due simply to the fact that they currently own it is disingenuous. It was completed by the LDS Church prior to the schism. It is important to the history of both the CoC and the LDS Church. John: I see your point that it can be read that way, but I said “Community of Christ has two” not “completed two”. Community of Christ has possession of the Kirtland Temple, which was completed in the early church period. The early church at the time was named “Church of the Latter Day Saints,” and is the precursor of all the denominations, including the LDS Church, Community of Christ, the Remnant Church, etc. I’ll add a footnote. @John, “Kirkland”? Really? Nit-picking aside, I appreciate your point. By the way, I spent a lot of time talking about differing understandings of temple worship because the difference is pretty huge and important to both sides. This notice is about the Remnant Church, which is pretty adamantly opposed to the idea that Joseph Smith had anything to do with polygamy. Meanwhile, many LDS members so associate late-Nauvoo rituals with temples, that they don’t imagine how Latter Day Saints can have a temple without them. I appreciate your clarification, and I agree that there are huge differences in temple worship between the various churches of the restoration. It is very interesting that there will be a new temple. I apologize for my Costco-infected typo. In fact, I’m ashamed of it. If CofC claims to have built the Kirtland and Independence temples, it must also claim the Nauvoo temple. To not would denote a non-functioning church in the mainstream timeline of Mormonism. As to the Remnant church temple, hopefully the architects of same will propose an edifice which really reflects this current century. The Independence RLDS temple made such a wonderful statement when it was drawn, design accepted and subsequently erected. One Latter Day temple has been left out: the temple built in 1849 by the colony of Lyman Wight at Zodiac, Texas. The Righteous Branch of the Church of Jesus Christ of Latter-day Saints also has temples in Utah (pyramid shaped) and in Nevada. Melvin and Chris: Ultimately, this would come down to what constitutes a “full-sized” temple on the original Kirtland model. Kingdom or Nauvoo-era temple rites were held in the multi-purpose building in Zodiac, which was remembered by Wightites as a “little temple” — but I would tend to categorize that building, like the Cutlerite churches, as an Endowment House. On the one hand, you might say that if believers call something a temple, it’s a temple. On the other hand, it’s very possible for a denomination of 1 person to declare that the guest room of his house is a temple and use it for temple rites. The LDS Church calls its multi-purpose building in Manhattan a “temple” — because a few floors have been set aside for LDS temple rites, but does it count as a temple on the original model? The difference of course remains in the definition and purpose of the Temple. Lyman Wight received the endowments of the Spirit as did so many others in the Kirtland Temple. In Nauvoo, LW witnessed the Nauvoo-era endowment, priesthood blessings, adoption, and sealings for time and eternity. The archival records reveal that the Zodiac Temple attempted to perform those rites and rituals that were performed at Nauvoo. I have no archival record for proof, but I do think that LW would not have ignored the spiritual endowment he received at Nauvoo when the ordinances at Zodiac were performed. I know almost nothing about Cutlerite ceremonies. John Hawley’s sworn testimony in the Temple Lot Case (1893) compares Zodiac and Endowment House (SLC) ceremonies. The Utah Temple for the Righteous Branch is “full-sized”. Endowment rooms on top level, congregational space on the middle-floor, baptismal font in the basement. The shape may be different then what people think of when they think of a “Mormon” temple, but it is a temple, none the less. Regarding the “guest room”-that probably does happen. Brigham Young said that LDS homes should have an altar in them. If you have room set aside for that purpose, you may consider that to be your personal/family version of a temple. Your “temple away from the temple” maybe? The Kirtland Temple would not be standing today had it not been “saved” by the RLDS Church. We owe a huge debt to those early Saints. However, since they lost the lawsuit for ownership in 1879 the actual “ownership” technically occured 20 years later due to adverse possession. Congrats to the Remnant Church for their ambitious plan to carry on the spirit of the Early Restoration. I’m from the Utah LDS Church and have my own opinions but we share a common heritage. I assume they will carry on with the RLDS/C of Christ tradition and allow all to enter and if this be the case a plurality of visitors (at least in the Summer) will be from the Utah Church. May our cooperation and fellowship continue as we preserve our history and celebrate our religious heritage. I have not seen this rendering of a future Remnant Temple, in fact, it is my understanding that they will proceed with architectural details after studying and coming to some conclusion as to what exactly they will do in the Temple. From whom did you obtain this artist rendering? This is a photograph of a painting that was in Remnant Church headquarters several years ago. As I mentioned in the original post, this was an early rendering, so it may not reflect the final design at all for the reason you mention. I have photographs of the Ozuma, Mexico temple, if you are still looking for some. I would like to see them. I saw a picture online years ago but can’t find it anymore. Any specific email I should send them to? Years later, I know, but if you’re still up to it, I’m an interested party. serve_the_overmind@yahoo.com (I apologize for my puerile 12-year-old email address, but it is still useful). If you could send them to me I would appreciate it. sseipel133@yahoo.es Thanks. There is another so called “fundamentalist” LDS church that has completed temples. it is Christ’s Church, also called the Righteous Branch of the Church of Jesus Christ of Latter-Day Saints. Their first temple was completed before the AUB or FLDS built their temples. While their endowments are similar to the Nauvoo era endowments they also perform Kirtland era ordinances. If you are seeking information on temple procedures they should be contacted.